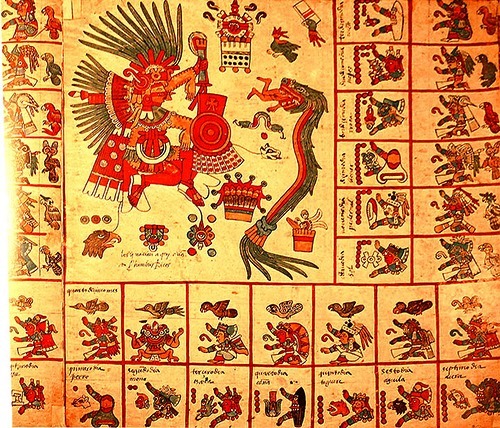 The original page 13 of the Codex Borbonicus, showing the 13th trecena of the Aztec sacred calendar. This 13th trecena was under the auspices of the goddess Tlazolteotl, shown on the upper left wearing a flayed skin, giving birth to Cinteotl. The 13 day-signs of this trecena, starting with 1 Earthquake, 2 Flint/Knife, 3 Rain, etc., are shown on the bottom row and the right column. 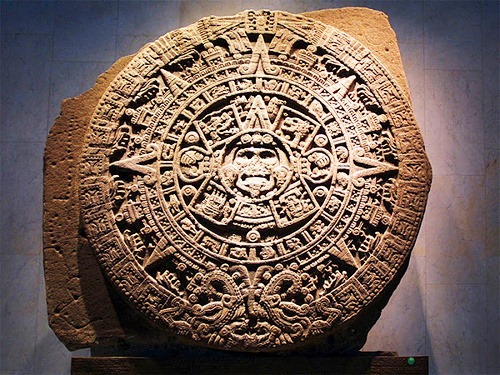 This is the Aztec Calendar, on display at the Museo Nacional de Antropologia in Mexico City, Mexico: it’s a huge basaltic monolith (it weighs 25 tons), Aztec called it Cuauhxicalli Eagle Bowl, but it is universally known as the Aztec Calendar or Sun Stone. 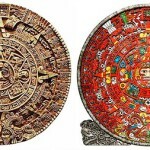 Traditionally, The Mayans see time like a river. 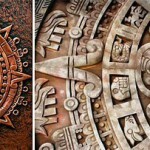 The Mayans also see changes in time as differences of tones, frequencies or even octaves, not just a hard measurement of something that never changes. 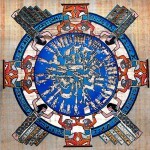 Known as the Dendera Zodiac, this bas-relief from the ceiling of the portico of the chapel dedicated to Osiris in the Hathor temple at Dendera. The map of the stars on a plane projection, showing the 12 constellations of the zodiacal band forming 36 decans of ten days each, and the planets. These decans are groups of first-magnitude stars. Used in the ancient Egyptian calendar, based on lunar cycles of around 30 days and on the heliacal rising of the star Sothis (Sirius). 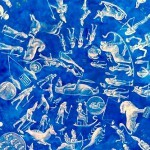 The zodiacal star chart part, actually painted on the ceiling of Hathor temple in southern Egypt, is currently at Brooklyn Museum. 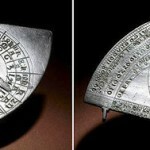 Widespread use of our ancient calendar stopped a little over 300 years ago, when Tsar Peter I by his Decree declared on the territory of Russia foreign calendar. In addition, he ordered the night of January 1, 1700 to celebrate the onset of the birth of Jesus Christ. 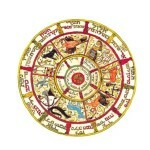 And in Russia at that time went on summer 7208 from the Creation in the Star Temple. Ancient Egyptian art has almost mesmerizing quality. 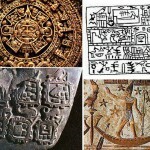 The complexity and sophistication of this ancient art work is simply astonishing. It is nowhere close, however, to what Mother Nature can create at the “spur of the moment” on any surface, like this ice crystals pattern on the parked car’s roof. 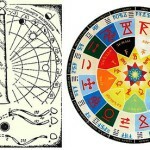 The ancient Slavic calendar – based on the hexadecimal value and forms a long period of time, called Svarog Circles. And in each of which the Sun passes sequentially through all the Halls of 16 for 180 Circle of Life. This is the day of Svarog. (Incidentally, the Circle of Life 180 x 144 = 259209 Leta (Summer Years) – it’s a known period of our solar system Yarily-sun around the center of our galaxy). Circle of Life contains 144 Leta.